Our 60-90 minute lab safety webinars provide focused instruction in bite-size nuggets. Some labs use LSI webinars for their monthly safety meetings, others use them to train new employees. Choose a single webinar topic from the list below for $395 per video conference connection. There is no limit on the number of people who may participate around a single connection, but each completion certificate costs $10. Also, discounts are available if you order 3 or more webinar topics at once. Contact us to design a customized webinar package that works with your needs and budget. There are four properties of chemicals that make them dangerous. We’ll review those properties and draw the connection to prudent practices, protective equipment and facilities to minimize the risk. Then we’ll discuss the six critical areas of chemical storage. The twelve parts of the standard are outlined and discussed. Special attention will be given to defining a Chemical Hygiene Officer and the eight elements required in your Chemical Hygiene Plan. The ANSI standard sets the stage for this discussion of glasses, goggles and face shields. When should each be used? 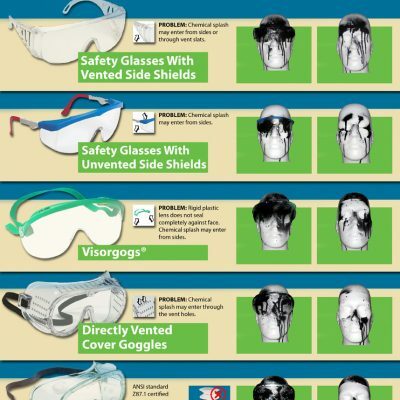 Wearing eye protection is an important safety practice; choosing the correct type to protect your eyes, however, is crucial. Eye wash fountains, contact lens use, and portable shields are also discussed. Safety rules exist, not because safety professionals stayed up late trying to figure out ways to make things take longer and cost more money. It’s because they know that when someone did it that way, they were either killed or crippled. Of course, you know that, but how do you convince others at your organization to take safety seriously? More to the point, How do you convince them it’s worth the budget? 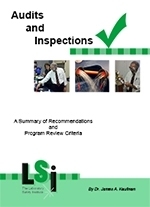 Over the past 40 years, LSI has discovered nearly 100 ways to convince others that lab safety is important. In this webinar, we’ll share the whole list and discuss several of the ways. Chemical labeling practices have changed and continue to change. 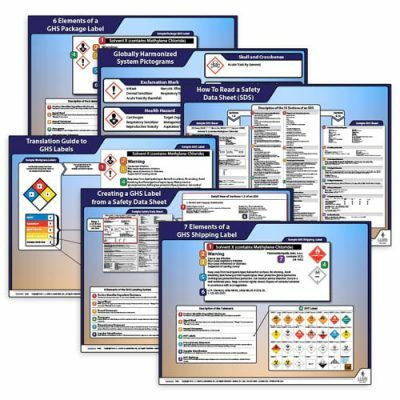 We are going to take a look at the various systems for chemical labeling and discuss the Globally Harmonized System. Understanding the nature of the three major types of negligence and your responsibilities as both a supervisor and an employee is critical for avoiding accidents, injuries, and damage to health and the environment. It’s also a great way to avoid law suits. 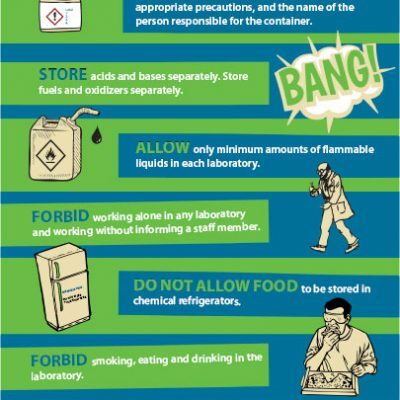 How do you know if there are unsafe conditions and/or unsafe practices in your labs? Do you have to wait for an accident or injury to learn? In this webinar, we’ll conduct mock lab inspections and sharpen our skills for identifying the precursors to more serious events. 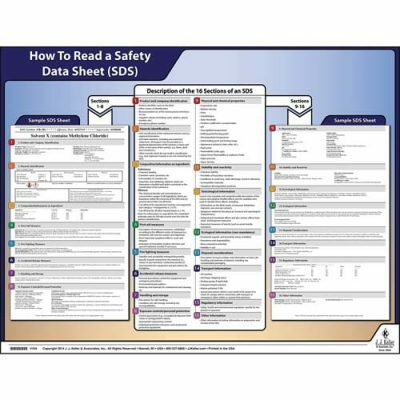 Is your employer obligated to comply with Federal OSHA regulations or state OSHA regulation? What does it mean to be a state plan state? What are some of the key regulations with which every employer and employee should be familiar? We are going to review the types of ionizing and non-ionizing radiation. We will learn how to protect ourselves from both natural and man made sources. Laser safety will be discussed. Why should be keep records? What record should we keep? How long should we keep them? What are the legal requirements? Labs are faced with an ever-expanding array of Federal, State and local regulations. What are these regulations? What do you need to do to comply? Learn some simple, effective and inexpensive steps that you can take to improve compliance and reduce the likelihood of fines. So many questions! Where can you turn for answers? We discuss some of the important information resources that are available both free and for a fee. 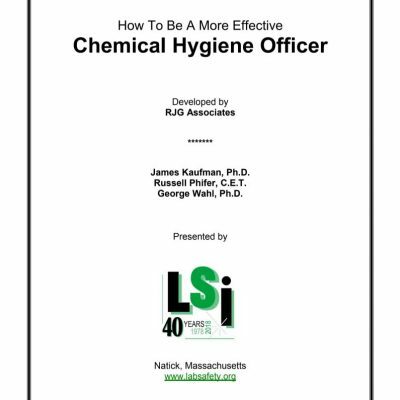 What do the best Chemical Hygiene Officers do that makes them more effective? After teaching and training hundreds of CHO’s, we can share many tips and hints to help you become even better. We begin with air circulations and air quality. 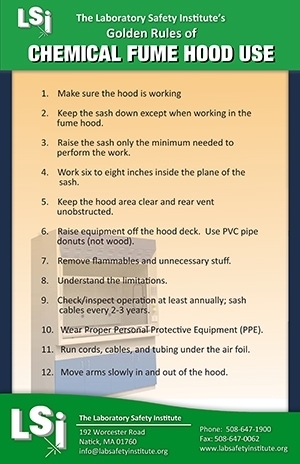 What are the various types of hoods? How do they work? 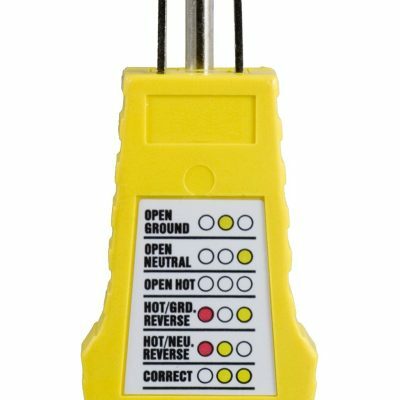 What do you need to do to use them safely? 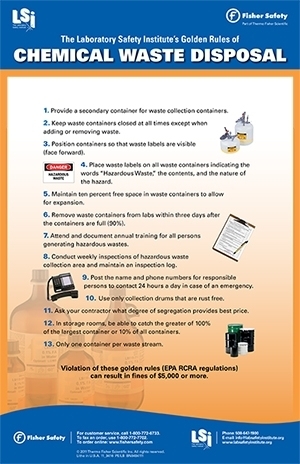 What are the golden rules of fume hood use? As an introduction package, you will spend 60 minutes learning about 4 important topics that will affect how you view safety in school science labs. After which will be a 30 minuet question an answer period. Our webinars are presented through go-to-meeting and with this package we will work with you to set up a time and date that is best for both our schedules. You can have as many people around a single connection at the time of the webinar. Should more connections be needed, such as someone cannot be at the same location but would like to attend, this will be discussed at the time of scheduling. Choices – Life is full of choices but sometimes it doesn’t feel like you have any choice. Here we will discuss how we do have choices and how these choices affect us and those we teach. Accidents – LSI has been collecting anecdotal accounts of lab accidents for over 35 years. In this section we share some stories. They are powerful examples, make lasting impressions, and serve as a graphic reminder. The stories have been published in our series, Learning By Accidents Volume 1, 2 & 3. Legal Aspects – One of the unfortunate outcomes of accidents is a lawsuit. Liability and negligence issues can’t be ignored in today’s lab operations. In this section we explain the types of negligence, the responsibilities of teachers and school administrators, and how to reduce the likelihood of lawsuits. 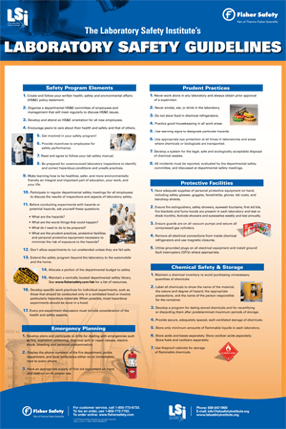 Planning for Emergencies – What are the twelve most common types of lab emergencies? What immediate action should be taken? How should you prepare to deal with those emergencies? Sadly, less than five percent of the more than 35,000 scientists and science educators we’ve spoken to have been discussing these emergency situations with their colleagues or written plan to deal with them. This 60 minute presentation will focus on the issues of safety and liability in science demonstration and strategies for making them safer. How do you more safely select, prepare, transport, and present the demonstrations that you will perform? What are the negligence and liability issues the come into play when conducting science demonstrations? How do you ensure that the pedagogical benefits outweigh the risks? Why is banning specific demonstrations not the best approach to solving the problem? Instead, what are the five critical changes that need to be made in science education to make demonstration accidents and injuries less likely? This is for any K-16 science teacher who wants to do safer demonstrations. You can have as many people attend as you wish around a single connection. If more connections are needed, please discuss at the time of scheduling.